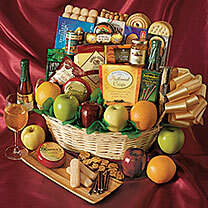 If you want to create a "wow factor", this the gift basket to send! 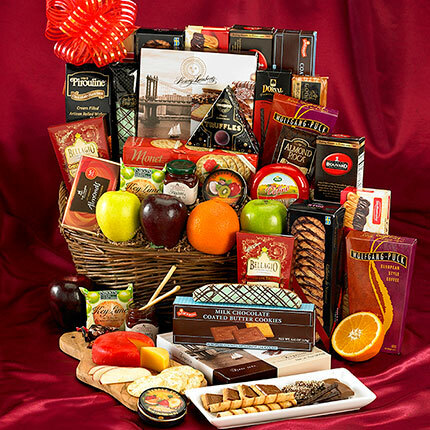 We fill a sturdy keepsake basket to overflowing with a stunning variety of treats — Ruma's hand-selected fruit, Gouda cheese, gourmet crackers, biscotti, decadent truffles, six varieties of cookies, jam, cocoa and coffee. 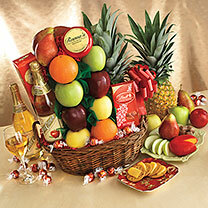 Makes an impressive gift for a special client, a memorable award to a team for a job well done, or a very special gift for friends or family.